The ocean’s energy locked in a unique fragrance. An all-over fresh aquatic body spray enriched with ocean water. Experience an intense revitalizing sensation inspired by breaking waves. Additional notes include bergamot, lemon, clary sage, spearmint, musk, cedar and woods. 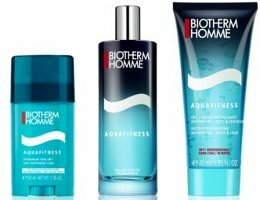 Biotherm Aquafitness is available in 100 ml Eau de Toilette and in matching grooming products. *A prior fragrance of the same name has been discontinued; this is a new version for 2013.
wow. a cologne that smells like the ocean.